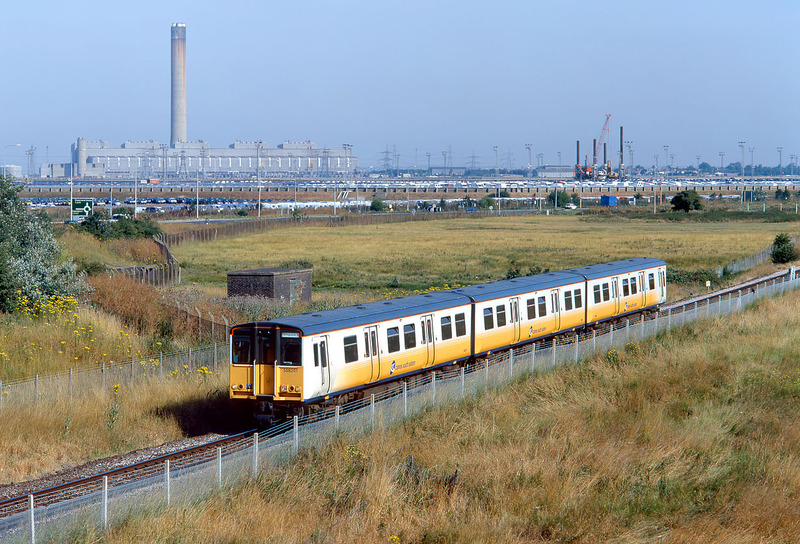 508207 crosses the flat grasslands of the Isle of Sheppey near Queenborough on 16 July 1999 with the 08:51 Sheerness to Sittingbourne Connex South Eastern service. Grain Power Station dominates the background, although what is not apparent from this view is the fact that the wide estuary of the River Medway, separating the Isle of Grain from Sheppey, is hidden in the middle of this picture. Grain Power Station closed in 2012, and the 801 ft high chimney (the second tallest in the UK) was demolished in 2016. Another step nearer forthcoming power shortages?